Steve Minardo finished 2-for-4 with three RBI including a two-run double in the third to lead the Titans (1-0). Ryan Hill had an RBI double, and Jim Marasco added a run-scoring single as Thomas pushed six runs across their third at bat. Justin LaLoggia picked up the win striking out three and surrendering three hits over four innings of work. LaLoggia had an RBI single in the first to help Thomas to an early 2-0 advantage. Damian Wright chipped in with an RBI groundout in the first. Caden Hahn went 2-for-3 with two runs scored for the Titans. Derek Ogi added an RBI single and Jake Canfield an RBI double for the Titans. Ethan Putney led Churchville-Chili (0-1) with two hits. Amaury Samalot and Ryan Demitrovic both had RBI singles in the first for the Saints. Brockport took advantage of Canandaigua’s generosity to rally for its second straight win. Trailing 3-2 in the seventh, Sam Velletri and Cole Penders both scored when Quinlan Ignaszak reached on an error. Christian Wiest struck out one and hurled a scoreless seventh for the win. 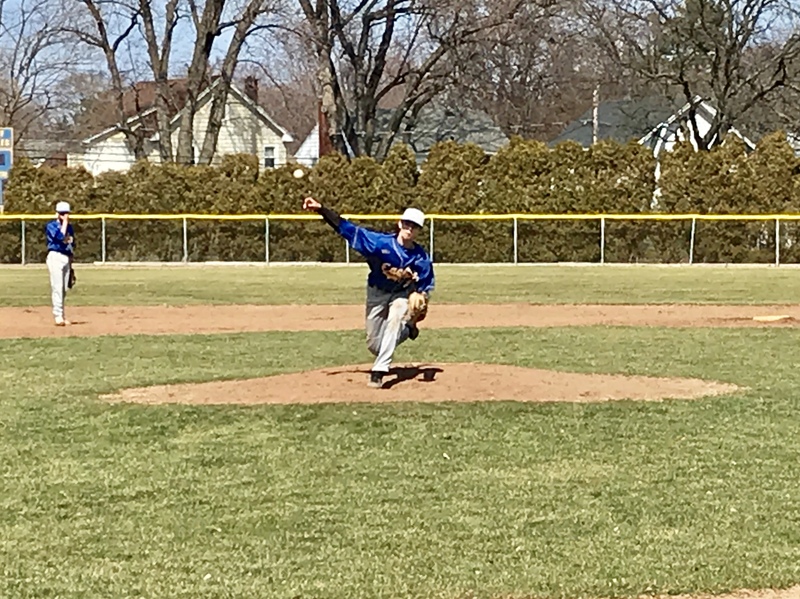 Frank Lauricella started and tossed four innings for the Blue Devils (2-3). The senior left-hander allowed one unearned run on one hit. He fanned six and walked five. Penders finished 2-for-3 for Brockport. Nick Nealon had an RBI groundout in the sixth. Joe Brinza paced Canandaigua (1-1) going 3-for-3 with a walk. Jordie Johnstone scored a run and drove in another for the Braves. Ryan Hubler went 1-for-2 with a with a walk and a run scored. Connor Fisher scored a run. Tristan Tyndall had a hit in his only appearance at the plate. Both teams are back at it in the same place on Wednesday at 4:30pm. Chad Gartland pitched a complete game 2-hitter and finished 1-for-3 from the plate to lead Irondequoit (1-1). The junior right-hander struck out 11. Jackson DeJohn, Chris Butler and Jose Morales each collected an RBI for the Eagles. Nick Serce scored twice. Isaac Yorkey had an RBI single for the Arcadia (0-1). Sophomore Noah Fasso struck out seven over four innings for his first varsity win. Kyle Feldman finished 2-for-3 with two RBI to lead Livonia. Tim McClare allowed one hit over six innings for the win. Jayden Castrechini picked up the save.